FineArtStore carries a full range of pastel fixatives including the very popular and economical basic Krylon 1306 workable fixative and Krylon’s new Fine Art Gallery Series Fixative. Many of America’s top pastelists prefer Daler Rowney’s Perfix, Lascaux fixative imported from Switzerland, or Sennelier’s Latour fixative. Sennelier also makes Delacroix fixative for graphite and charcoal drawing. Spectrafix is available as a more environmentally friendly non aerosol formula. 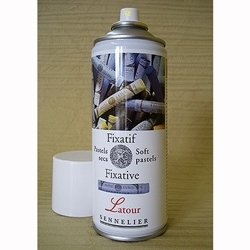 Oil pastelists will be happy to find one formulated by Sennelier called d’Artigny spray fixative.